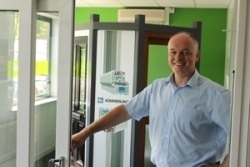 Dekko Window Systems says it has seen sales of its Kömmerling window and doors, including the PremiLine patio door, ‘increase significantly’ since becoming part of Kömmerling’s UK fabricator network in 2012. Dekko claims the recent introduction of the PremiLine patio door has ‘done much to boost sales’, along with the launch of the run-through sash horn for the Kömmerling O70 Gold window system. The O70 Gold window and door system has apparently proven to be a ‘firm favourite’ with the customers of Bredbury based Dekko, thanks to the energy efficient five-chambered design, wide range of foiled options from stock and other key features.